Project Leave Behind is funded through the Florida Department of Children and Families. The program provided the initial supply of kits, which were distributed to Orange County fire stations on Oct. 9, 2018. The kits are now available for OCFR personnel. “I often remind myself, and encourage crews to remember, that every call is a call to someone’s loved one. My goal is that through Project Leave Behind, we equip loved ones with a series of tangible actions, proper instruction and a lifesaving tool to be initiated while help is on the way. It is a true partnership between family and first responder,” said Chief Drozd. Those receiving the kit will be provided with a brief training on how to administer the nasal spray and what to do in an emergency until help arrives. Responders will also underscore that while administering Naloxone is critical, just as important is transport to the local emergency department and substance abuse treatment. Kits are available in English and Spanish and only distributed by paramedics during the response and treatment of a patient. “Research shows that Naloxone begins to reverse the effects of opioids 1-2 minutes after administration. Evidence supports that early administration saves lives. We’ve been provided with an initial supply of 326 doses, with the anticipation of additional doses as needed,” Dr. Christian Zuver who serves as the EMS Medical Director for Orange County. Orange County Fire Rescue paramedics administered Naloxone 1361 times between Oct. 2017 and 2018 in cases of a suspected overdose. In most cases, the patient was male, between the age of 25 and 34. In 23 percent of cases, the patient was found unresponsive. The Naloxone distribution program was first brought to Orange County and brought to Fire Rescue through the vision of a University of Miami medical student, Austin Coye. She attended the Oct. 8, 2018 announcement and hopes to assist other fire departments in Florida in launching similar efforts. Today’s announcement was made at Orange County Fire Station 81, located just off of the Econlockhatchee Trail in Orlando. For additional information on the Orange County Heroin Task Force and to connect with local services please visit the Heroes Against Heroin website, www.ocflheroesagainstheroin.org or call 211. 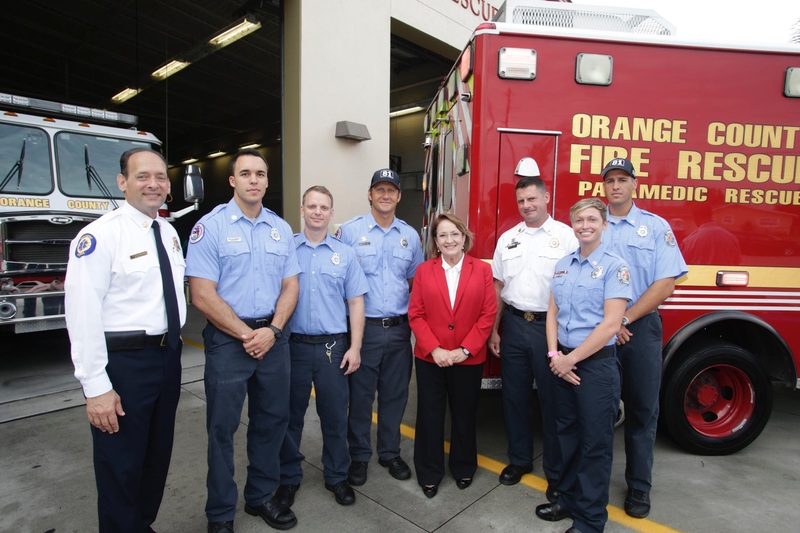 Photo Caption: Orange County Mayor Teresa Jacobs joined Orange County Fire Chief Otto Drozd III and first responders to announce Project Leave Behind on Oct. 10, 2018.